In just a few days (September 24th, 2010), this family will begin enduring a 15 day nightmare. The annual “Spirit Festival” is anything but fun for this family, because Song, the witchdoctor, is demon possessed every single day during this time. Those of you who have prayed for our ministry through the years already know most of this incredible story, but with God’s help, I will try to summarize their story for all of you. Sua (not pictured in the above picture) visited our church in 1998 with a friend. She had no idea what she was getting into that day, but God was leading her every step of the way. That week we found out her father was a witchdoctor, and we proceeded to follow-up on her like we did all others. Her father gave permission for her (then just under 20 yrs old) to come to church again. He then gave permission to the whole family to attend our church. 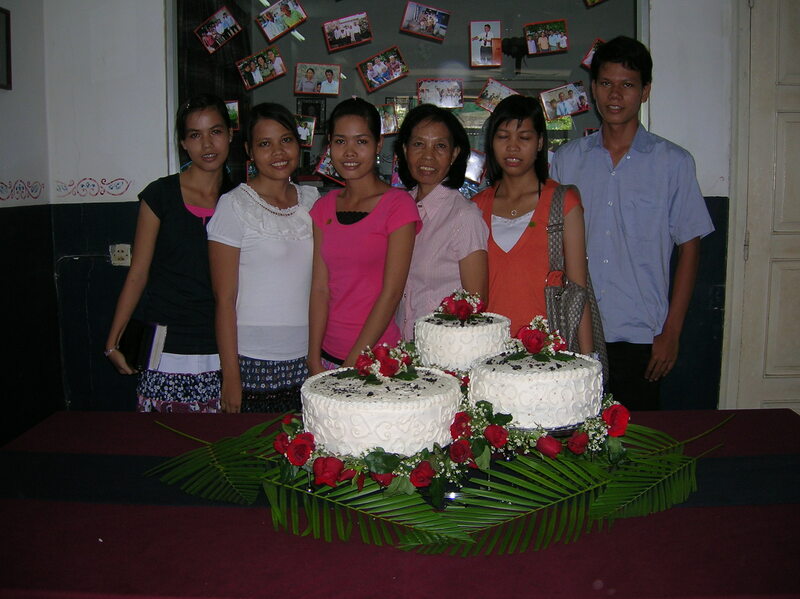 Heng (in the middle of the above picture) was the first from their family to get saved. When she told me that she was trusting Christ and wanted to be baptized, I had to ask her the hard questions. “What about the spirits your husband worships?” She said, “I don’t trust in them anymore. I trust Jesus.” “Well,” I said, ” are you lighting incense to those spirits? I think your husband will be very angry if you stop worshiping those spirits.” “Yes.” She said, “He is already angry because I stopped last week!” I baptized her that day, and she became an example of faith for her children. Since 1998, Heng has endured many beatings from her husband because of her faith in Christ. God continues to teach her how to trust Him and how to love her husband while hating the demonic spirits that regularly possess him. Song, the witchdoctor, seemed determined to give (more like sell) Sua away in marriage. He made many lucrative marriage arrangments; Khmer-American, rich Korean, rich Cambodian. Sua refused all of them because they were not Christians. She courageously bore the beatings each time. Song told his family and me that he would never let Sua marry a Christian, so she should just give in now. We were asking God to give Sua a Christian husband, then in 2001, Sua told my wife and I that God was leading her to be missionary to the Vietnamese people. I told Sua, “Do you realize that this means you will likely never get married? There are a very few good Christian men here in Cambodia, but there may not be anyone who is called to go to the Vietnamese people.” She said, ” I know. I already thought about that. I may never get married, but God wants me to be a missionary to the Vietnamese people.” Six months later, a young man visited from America to survey Cambodia. 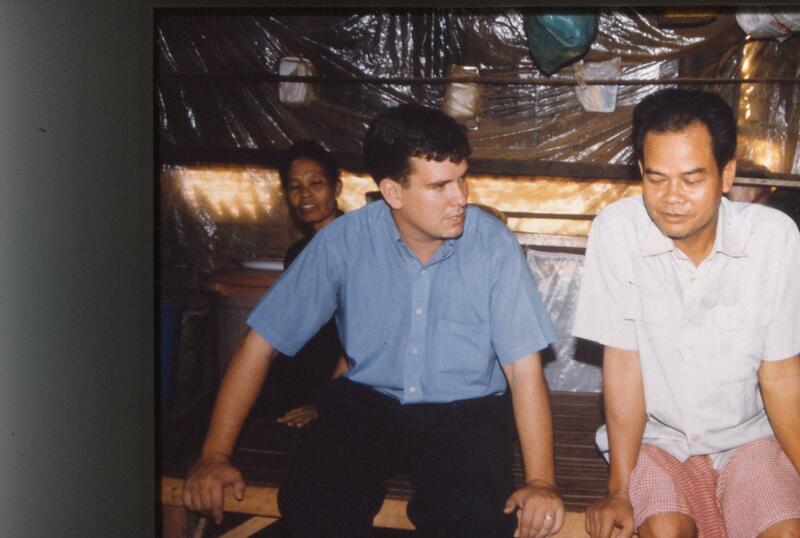 He was interested in reaching Vietnamese in and through Cambodia. They got to know each other. Sua’s dad miraculously agreed to the marriage, and they were married. 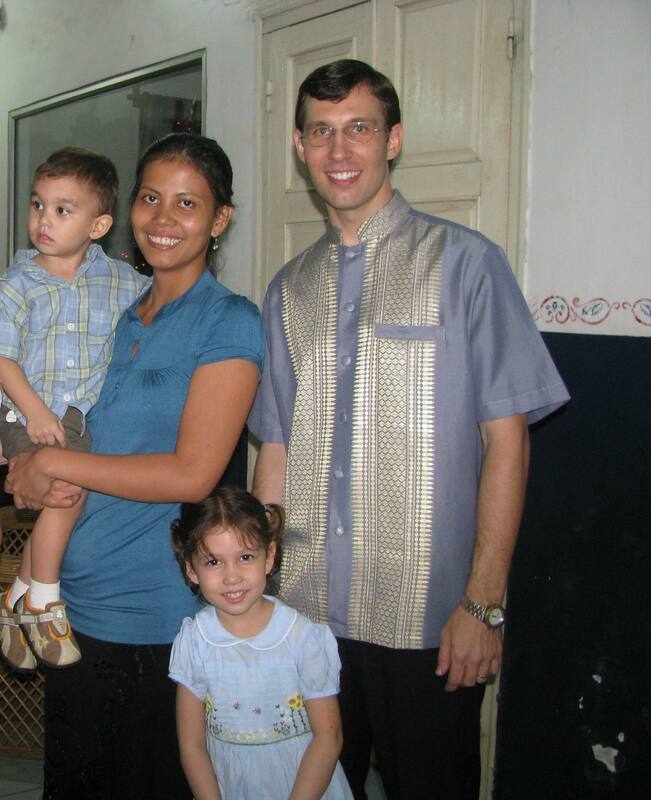 Ron and Sara (her American name) Smith are on furlough right now with their daughter Jasmine and their son Joshua after serving their first five year term as missionaries to both Cambodia and Vietnam. We serve a GREAT GOD! Sung (top picture in the white shirt) was saved shortly after Sua. Sung has endured much hardness as a good soldier of Jesus Christ. When Sua married Ron and moved away, it seemed as if Sung was then taking the brunt of the beatings. She has been through her ups and downs, but she continues to stand for Christ amid great persecution. Sung has been helping Ron and Sua in their ministry for a number of years now, and it is easy to see the great love that God has put into her heart for the children in that ministry. Seoung (top picture in the bright pink shirt) is very outgoing and very expressive. One of her favorite ways to express herself is through singing. She loves to just open up the hymn book and sing song after song. Her father, especially when demon possessed, will not stand for singing that glorifies God. She has been beaten many times for just this “crime”. Seoung has escaped to our house on more than one occasion to sit in a room and sing her heart out for hours on end. God is using her also to help the Smith’s with the children’s ministry. Sigh (top picture in the black shirt) was only about 10 or 11 years old when her family started attending our church. To say she was shy is a huge understatement. Sigh would hardly speak a word to anyone outside of her family, but she never said a word to men even within her own family. It would be many years after her salvation before I would finally get to hear her soft voice. Through God’s grace, Sigh is doing that which I never thought she would do…. 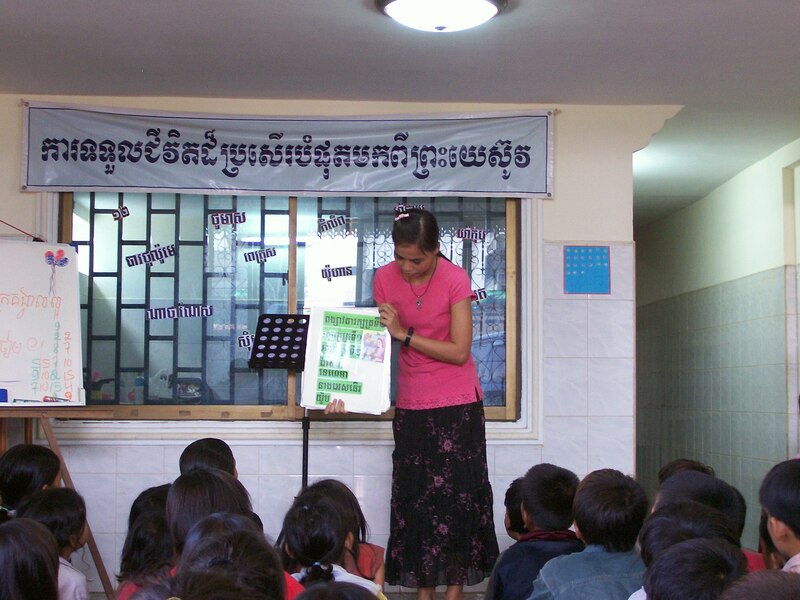 She stand up and teaches children songs, verses, and Bible stories. She is a part of the family team serving Christ with the Smiths. Chamrong (top picture, far right) and Chamraen (second from the right) are twins. They were eight years old when they began coming to church with their mom and hardly able to understand the spiritual warfare that was being fought right in their own home. After a couple of years, they too accepted Christ and are now helping the Smiths with their ministry as well. Under Ron’s guidance, Chamrong is growing into a fine young man. Ron has given Chamrong the opportunity to teach the teens and adults on a regular basis. One day Becky and I visited the witchdoctor’s home, and he was possessed by demons. Using Song’s body, the demons said many terrible things about God, us, and Song’s family. Once the demons had left, Song returned back to normal, but his children wept uncontrollably. Assuming they were embarrassed or worried about us, Becky tried to comfort them by assuring them that we were fine. They immediately made it known to her, that it wasn’t her they were worried about. It was their father. They said, “He needs to be saved! If you and pastor see him like this, you might begin to hate him and stop praying for him. Teacher, please don’t stop praying for him to be saved!” Song, the witchdoctor, does not wear feathers on his head. He is not a “sight to see”. He is a man lost in the darkness of his sin and blinded by the deception of devils. He desperately needs to be saved as much as any other lost man. God has used Song to teach me alot over the last 12 years. God has taught me that He loves Song just as much as he loves anyone. It breaks God’s heart to see Song separated from Him, willfully putting himself under the power of Satan, and rebelling against the God who died for him. God has also taught me how He can take such terrible circumstances designed by the Devil to destroy and use them to make precious jewels like Heng, Sua, Sung, Seoung, Sigh, Chamrong, and Chamraen. The Lord has also showed me the value of our prayer partners in America who have committed their faithful prayers to us, this family, and our ministry over the years. Please pray for Song to be humbled before God, to realize his absolute need of Christ, and for him to turn from devils to the true and living God. Please pray for these demons to be restrained from their work of deceiving and destroying.